Having undertaken many SEO projects over the last seven years, from small local campaigns to international projects in a variety of niches, we have found that many businesses believe their competitors to one group of companies but when it comes to search, it turns out that it’s a different group of companies entirely. One of the first things we do in our initial kick-off meetings is to establish a list of competitors from the client so we can find out how they perform against each other. Much of the time we find that businesses aren’t competing with who they think they are when it comes to search. This blog post will take you through a few key points to ensure you know who your competitors are in the SEO world. The first thing to do is compile a list of your main business competitors, these are the businesses you can think of off the top of your head. If you offer multiple products or services then you might want to split your competitors out by topic. You can also mark your competitors as to whether they are a primary competitor or secondary competitor based on the level of crossover of products or services. This is the type of list we’ll typically receive at Anicca which we can use as a starting point. Once we’ve got this list, as well as an understanding as to the topics we want to target for the client, we can then begin to analyse the clients and see how they perform. For this, we use our SEO tool of choice, SEOmonitor. As you’ll see below, we have collated a list of topics for the services we offer, and for each of those topics, we have separate lists of competitors for each that we have identified. Now, this is a good starting point, some of the competitors we identified are ranking for the phrases we want to be visible for. But, these five competitors wouldn’t even make a full page in the Google results so it’s clear there are going to be thousands of other websites wanting to be prominently placed on Google for these phrases so now it’s time for us to find some new ones. This can be done a number of ways including Googling some of the phrases and putting the websites that rank into a list. However, this will take quite a bit of time if you’ve got hundreds of phrases being tracked! Instead, what we do is use SEOmonitor to identify the domains that are ranking in this topic. Most high-level SEO tracking tools will have a similar function to help you identify competitors in this way. As you can see, straight away we’ve got a list of websites that rank well for the group phrases we want to rank for. This is a prime example of how your competitors might not actually be the competitors you originally thought. 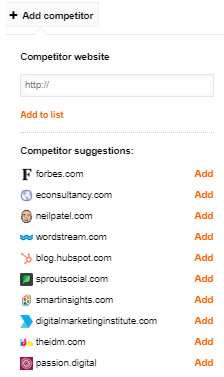 For example, the first suggestion there is Forbes.com, a website that is by no means a competitor to us whatsoever, but their incredibly high domain authority means anything they publish relating to the marketing industry is likely to rank well. We can also see here that our main competition is not actually businesses or other marketing agencies, but news websites and industry blogs. Once we have this data we can then use a secondary table to add in the actual competitors along with the competitors we originally had and compare which sites rank well. Usually, we find that most of the list is compiled of websites that SEOmonitor suggests rather than the original list. You can also grab their domain scores too, as this will give you a clear indication of whether they are ranking primarily because of their large domain authority or whether it’s because the content is of a high standard. So, now you have this data what do you do with it? It’s all well and good knowing who the real competitors are but the real question is, how do we beat them? First off, we need to look at the competitor websites to see what they are doing, specifically on the pages that rank highly. Are they optimising their website well, using call-to-actions, the pages loading quickly and offering a great user experience? Is there a similar structure to the content on these pages, such as the use of lists, video, images and use of semantic terms. Is their blog or landing page clearly linked to and visible on the website and linked in the navigation for example? You can use a free tool such as Screaming Frog (for up to 500 URLs) or a paid tool such as Deepcrawl to crawl these websites. The aim of this is to understand how they structure their page titles, meta descriptions, are they adding ALT tags to images? Try to find patterns across all the websites E.G are all the page titles for sites on page one of Google under 55 characters, contain a specific word, have their brand name at the start or end? 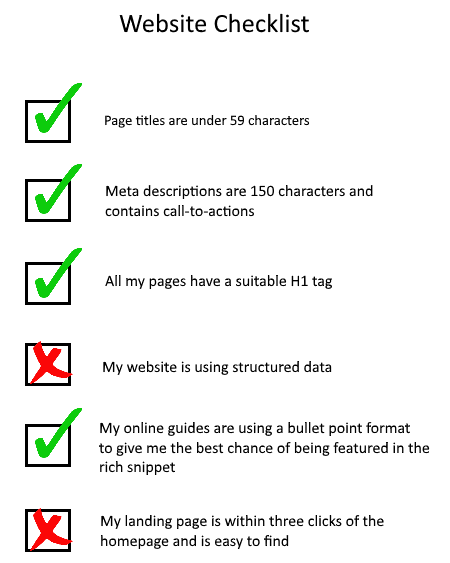 Once you’ve analysed the competitor websites, record down the similarities you see through these sites and you can then use this as a checklist for your own website. You know that these pages perform well in search and therefore must be satisfying both user and Google’s needs well, so use this to inform your own pages. Your checklist might look something like the below example. Once you’ve created it you can go through everything and mark off what you have and haven’t done. Once you’ve ticked everything off the list and you’re happy that your website is as well optimised and easy to use as your competitors you need to ensure your content is more helpful and has more insight. Take a read of the competitor websites and see if they are missing any important information, did you get everything you wanted to know from their website? If not, then be sure to include that on your own website! Hopefully this guide will help you uncover your true competitors in the SERPs and help you get ahead of them. It is incredibly useful to know who you’re competing with in the SERPs, as it will also give you an indication of user intent. If you’re an e-commerce store but every site that ranks for terms you want to be visible for is a blog or news website, you know that there is little chance for you to rank unless you struture pages in a simlar way. By following these steps you will be well on the way to getting your website ranking in those all-important top Google positions. If you need any help with uncovering further insight about your competitors then be sure to get in touch with us here at Anicca. You can find out more about our SEO services by clicking here.